Yesterday i went to do my regular PS check, the lady doctor told me baking is a bad hobby (because my blood pressure was slightly high and my weight never gone down ^_^), i was quite upset and no mood to update any post yesterday. Anyway, i am ok today, because i still continue to bake bread now. My life will not have fun if i am not doing any baking, hehehe..
Last week i made another two Birthday cakes for my niece and nephew. One of them is Tiramisu Cake which i was inspired by Phong Hong Bakes and the recipe in a magazine that i have bookmarked for a longer time. You can see the first layer is pale if compare to the rest, because i was totally forgotten to add the coffee syrup and chocolate shaved while assembling the 1st layer of cake..I blamed to mooncake, because I was busy doing mooncake at the same time too, hahaha.. Try not to omit the strawberry sauce, you will be surprise the taste when you eating this cake with the strawberry sauce..Also i omitted raw egg yolks in cream cheese filling instead i add gelatine ..
1. Sprinkle gelatin over the water in a bowl, stand the bowl over a pan of simmering hot water till dissolved and clear liquid. 2. Beat cream cheese and sugar until light and fluffy. Using the same mixer, beat whipping cream till soft peak. 3. Fold in whipped whipping cream and gelatine into cream cheese mixture, mix till smooth. 1. Line a non-stick baking paper on a flat tray. 2. Place sugar in a small, heavy bottom saucepan set over low heat. 3. Cook, stirring occasionally, until sugar melts and turns a golden brown. 4. Add almonds, stir to coat all evenly. Remove from heat and tip onto prepared tray. 5. Leave to cool and set before crushing almonds. 6. Store in air-tight container jar until ready to use. 1. Combine water and strawberry in a heavy bottom pot to a boil. 2. Add sugar and simmer until pulpy and thickened, stir from time to time and take about 5-7mins. 3. Taste, you may want to add more sugar. 1. Slice the sponge cake into 3 even layers. 2. Place on layer into a 7” removable bottom pan and drizzle with half of coffee syrup. Top with half of cream cheese filling. Sprinkle with chocolate shavings. 3. Top with the second layer of sponge, drizzle with balance coffee syrup. Top with balance of cream cheese filling. Sprinkle with chocolate shavings. 4. Top the last layer of sponge cake, cling wrap the pan, refrigerate overnight to allow cake to set. 5. The next day, remove cake from refrigerator. Place on a round board. 6. 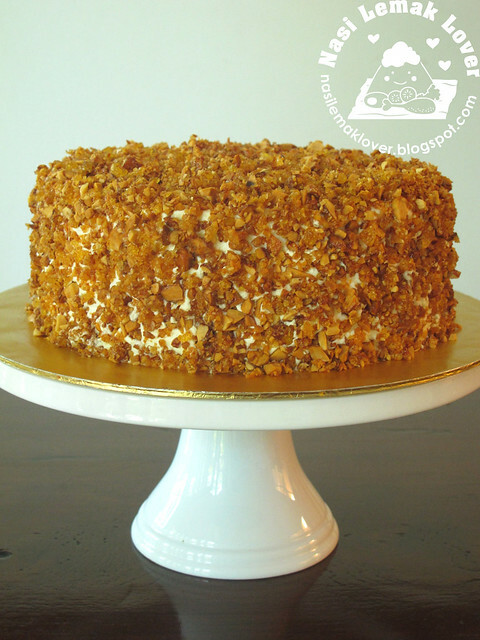 Spread whipped cream onto the top and sides of cake evenly and cover with the crushed, caramelized almonds. 7. Slice and serve chilled with strawberry sauce on the side. Hi Sonia, those almonds coating the cake look amazing! If I see a cake like at the stores, I would grab it off the shelf. I understand how hard it is for us who love baking not to do any at all, but I guess we do our best to take care of our health by cutting down sugar and fats(if possible!). Take care! Sonia, thanks for the mention and you have done it beautifully! Don't listen to your lady doctor. Where got baking is a bad hobby. Is gelatine powder and agar-agar powder the same thing? I can't find gelatine powder. Phong Hong, they are totally difference thing. I can send some gelatine powder for you..check out your mail box later. Baking is a passion and as a hobby as well too. As long as we take care of our daily diet and we have a healthy life. I would love to bake this tiramisu cake one day. You baked it so beautifully. i would love to try out this Tiramisu because it is eggless and not using mascarpne cheese. Maybe i will do one today for my son's birthday. I had the same problem, when i knew my blood sugar tend to be on the high side recently, i was a bit disappointed as i couldnt bake and eat my cakes as often as i like , but now I'm more conscious about the food i eat and also make time to exercise, so that i can still eat and enjoy the food in a modest way, the key is not overeat and exercise more often. i like it so much !! yummy yummy !! OMG! So awesome your tiramisu cake. Seriously, I find baking is not good for me too. Unlese I only bake, but not eat my bake. Can ah? Hi Sonia, your tiramisu cake look excellent, very well baked. As long as we eat healthy and with sufficient sleep, baking is not a hazardous hobby. When reach certain age, blood pressure sometimes tend to go up a little. Drink fresh guava or starfruit juice half an hour before breakfast. And sip green tea thru out the day. If possible go for a half hour walk everyday. I'm back...! This is a very different Tiramisu. I like to see the almond coating.....can imagine it adding more texture and taste to tiramisu. Yum! First time I heard baking is a bad hobby. Don't let it affect ur mood. So need to take care of our intake and have enough rest that's all. This cake looks very elegant on the cake stand and I love ur serving plate, very pretty. aiyo, without baking, our life become so pale and lack of excitement. Dont worry sonia, u bake, i eat, sure u can always stay healthy, hahahaha! Sonia, I came to know about this kind of Tiramisu cake when I was in KL celebrating Reese's birthday. We actually went to this restaurant to taste it, it tasted heavenly! And yours looks exactly like it! I replicated this cake before but not as pretty as yours. And yes the crunchy almonds is the BEST part, I guess we all have to balance our lifestyle and our eating habits. Giving baking shouldn't be an option especially since u love it so much! If I stay close to u, I'll drag u to go running with me everyday, heehee! Stay cheerful my friend! one of my favorite cake. 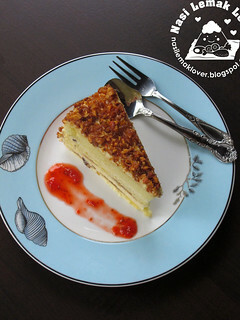 Wish that i can have a bite of that piece, hehe..
Hi, I am really liking this recipe... I got a friend who like sponge cakes soaked in coffee... so i can make one like this... but i have a little question.. Did you fold whipped whipping cream in the cream cheese mixture or you fold the liquid whipping cream?? 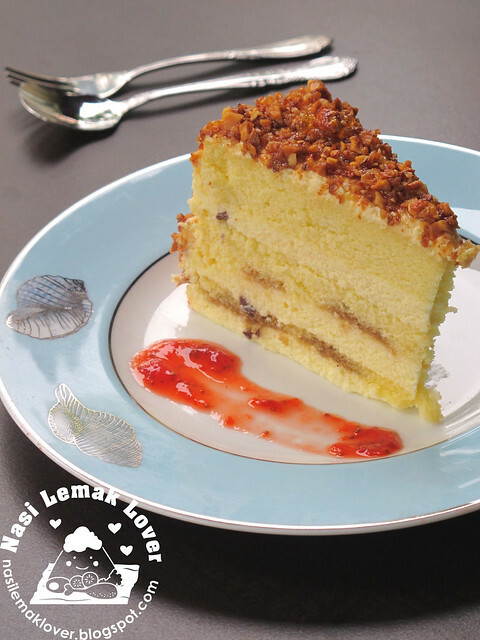 Just wondering... Its looking delicious..
With the caramelised almonds topping, this cake must be very yummy! Wow tiramasu cake love it. love ur tiramisu. i m not dare to do it. seen like many step n need more experience to do it. hope i can make it one day. Try to cook chinese celery (芹菜)with water and drink. It works effectively to lower the blood pressure. But can not drink everyday or else will become low blood pressure. I would love to eat this cake as I love Tiramisu and this looks delicious! You are always the greatest auntie in the world, hahaha! In regard of the diet, I have started a dessert free diet from Mon & would like to stick to it for 2 weeks to see how much I can resist the dessert. My summer pants all are getting tight loh, that makes me scare. And will cut down my main meals by little bit, not too much as if i go extreme, it won't work. I'm not greedy, only want to lose 1-2kgs. Die lah, I haven't done a medical check-up! You don't have to eat, just bake for your family & friends loh, I know, it's cruel can't try something that you bake for but we can do this together, gambate! I have to put aside all my dessert recipes & made some wholemeal bread yesterday! This is nice......looks really delicious! Your cake looks tempting and must tasted delicious. Definitely must try. We need to take care of ourselves and make exercise a priority. God be with you. Awesome tiramisu ... so yum, yum. Baking is a passion and a very good hobby, it really fruitful my life.. without baking, i thk my life will become no excitement, no colour liao..hahaha..much important is we need to takecare of our healthy diet, eat more then do more exercise lo..:)...Sonia, u very pandai lo, looking at your tiramisu cake, especially the caramel almonds topping, mouth watering dy....hehe..
Sonia, lovely. Looks similar to the one from Alexis with caramelised almond. I should start to do my check-up soon with all the baking. 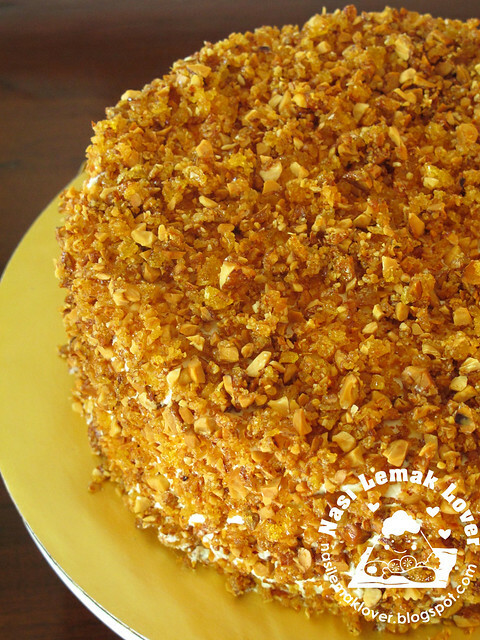 I love almonds and caramel coated almonds all over the cake! I've never seen it! If you leave me with the cake, the cake will be baldy because I eat all the toppings! This tiramisu gotta be the best ever! Your tiramisu looks great I like the almonds coating and the cream cheese filling which you do not add yolk. 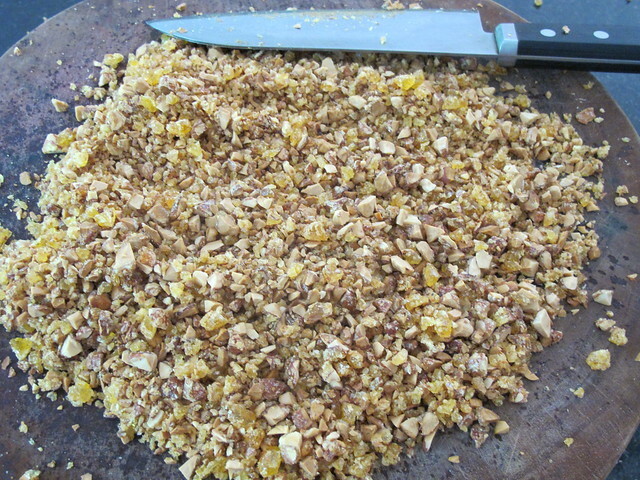 Instead of crushing the caramellize almonds with knife,? 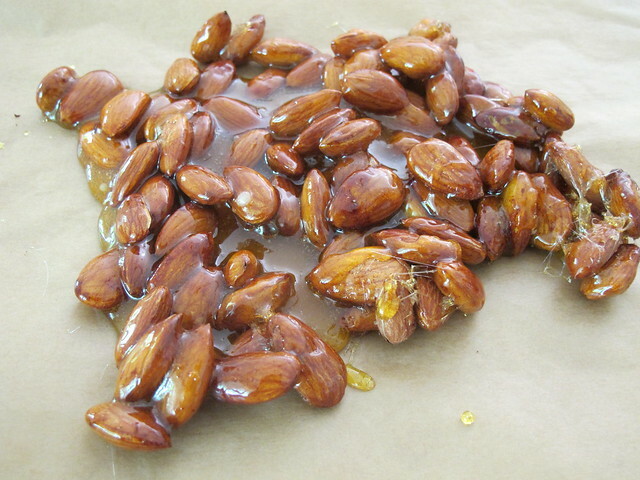 Can we just pop the caramelize almond into a zip bag and bash them with a rolling pin? Mui Mui, ya hor, why i did not think to use zip bag and crush with rolling pin, you try out, and let me know if this way work ok or not. actually i cant remember the recipe but i remember the photo from the magazine, the caramelised almonds must have tasted so goood!! baking is not a bad hobby..if no hobby , then it's bad! Looks yummy! I just made Tiramisu cake yesterday for my mom's birthday which is today...But I used 9 egg yolks for the cream cheese filling & it tastes phenomenal! I'm wondering if this recipe taste the same?